Lisa Notes: Raking or Digging? 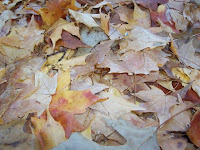 Raking is easy, but you get only leaves; digging is hard, but you might find diamonds. I finally finished the first 400 pages of John Piper’s Future Grace. It’s taken a few months. And I still haven’t read the endnotes (which, yes, I feel compelled to read before I can officially put the book back on the shelf). To me, it was not a raking kind of book. It was digging, i.e. work. But the diamonds I found made the digging worthwhile. Digging can be sweaty work, but it's a good sweat if there is purpose in it.